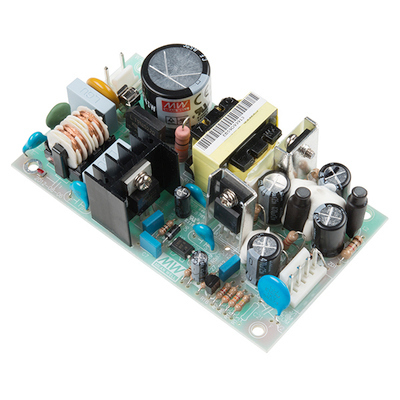 This thread explores some of the bipolar and triple output power supply offerings from Meanwell. I've offered the Meanwell P25A14E-RB triple output desktop "brick" supply in my Etsy store for some time. 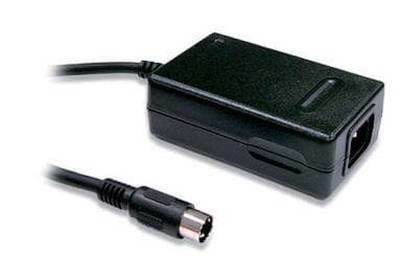 The P25A14E-RB is a simple plug and play solution to power audio DIY projects. Unfortunately the P25A-series is discontinued and only available in limited quantities. The Meanwell P25A14E-R1B has +5V @ 2.5A, +15V @ 0.5A and -15V @ 0.3A outputs. It powers the current-hungry Dual Class-A and doesn't break a sweat running the PTS and MS-II boards which pull <100 mA. The P25A has OK voltage-regulation/balance with the +15V output at very low currents sometimes measuring as high as 16V. For quiet bipolar outputs it also requires the 5V output to be loaded at around 500 mA (10Ω 2.5W). When the 5V is unloaded a line-synchronous "ripple" develops in the P25A's bipolar outputs. This appears to be some kind of "hiccup" or burst mode to improve low-power efficiency. That said, even with the 5V unloaded I've found boards powered by the P25A to measure as quiet as those powered by linear supplies. With the P25A desktop supplies discontinued and the GP25A noisy I decided to try the Meanwell enclosed frame RT-50C triple output and the open frame PD-2515 dual output. The RT-50C noise and regulation is similar to or slightly better than the original P25A triple output but in an enclosed frame. 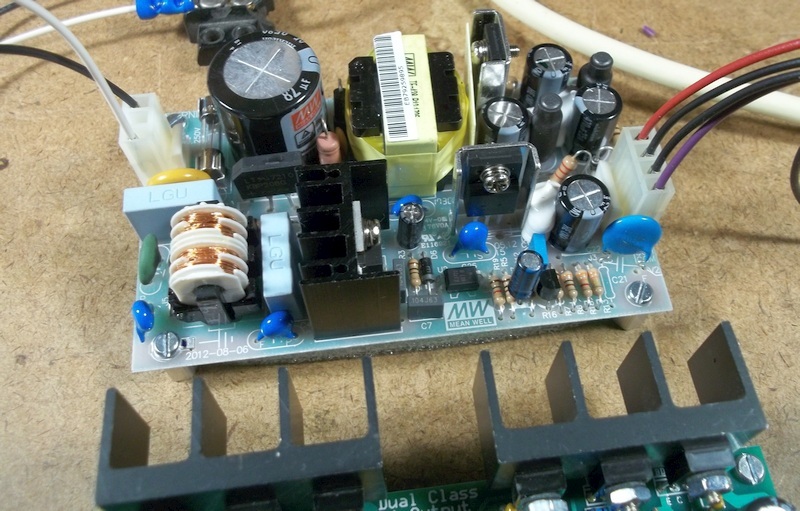 The adjustable 5V output (4.0A) does not require loading for the bipolar supplies to be quiet. The +15V is rated at 1.5A. The -15V output is 0.5A. The RT-50C has low noise but the unloaded +15V output actually runs about 16.5V. It appears that the topology and current capability of the P25A, GP25A and RT-50 allow them to only regulate two of the three supplies well. 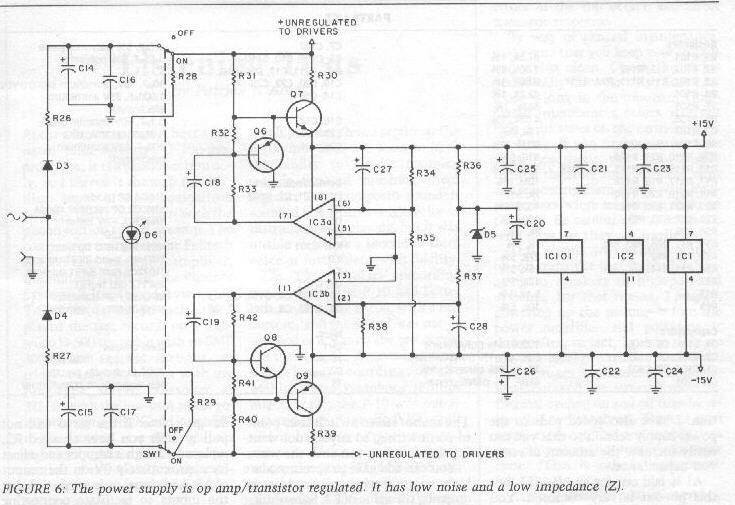 While balance isn't particularly important for conventional op amp circuits the unregulated positive output, if lightly loaded nears the 17V absolute maximum of some op amps. When loaded more-heavily the output voltages fall into range. The unregulated +15V outputs of the P25A and RT-50C are quiet - on the GP25A it is not. 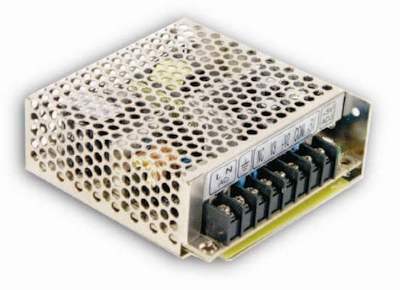 The Meanwell open frame PD-2515 bipolar supply (Mouser PN 709-PD2515) has +/-15V 800 mA outputs with very low noise and excellent regulation. Each output measures almost exactly near 15V for near-perfect balance. Here is a picture of the Meanwell PD-2525 running the Dual Class-A-II. A Meanwell PD-2515 bipolar switching supply powering the Dual Class-A II headphone amp. I had a chance to make some DC and noise measurements of the Meanwell supplies. The load was approximately 120 mA. 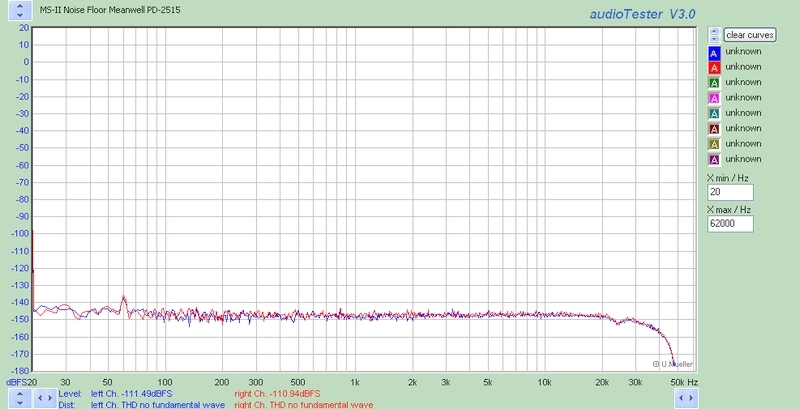 The 100 kHz noise measurement is with the HP400FL filter engaged. The 4 MHz measurement is the specified bandwidth of the meter. The PD-2515 does not have a 5V output. The transformer and secondary rectification stage is full-wave center-tapped with a topology identical to that of a bipolar linear supply. Regulation is by opto-isolator feedback from the positive output. The PD-2515 is a true bipolar, symmetric, supply. The other Meanwell supplies listed here have 5V supplies. Their +15V outputs appear to be from a stacked secondary on top of the 5V winding and subject to 5V loading. Regulation is optimized for the 5V rail. +15.63, -14.42 measured with 5V loaded in 500 mA. V+ noise -63 dBu (100kHz) -39 dBu (4MHz) 5V loaded in 500 mA. V- noise -70 dBu (100kHz) -39 dBu (4MHz) 5V loaded in 500 mA. When the RT-50C has its 5V supply unloaded the noise is essentially identical. The bipolar DC voltages are more accurate when the 5V is unloaded. +15.33, -15.05 measured with 5V unloaded. V+ noise -64 dBu (100kHz) -39 dBu (4MHz) 5V unloaded. V- noise -70 dBu (100kHz) -39 dBu (4MHz) 5V unloaded. +15.32, -14.95 measured with 5V loaded in 500 mA. V+ noise -52 dBu (100kHz) -40 dBu (4MHz) 5V loaded in 500 mA. V- noise -68 dBu (100kHz) -40 dBu (4MHz) 5V loaded in 500 mA. When the P25AE-R1B has its 5V supply unloaded it is considerably noisier. +14.72, -14.32 measured with 5V unloaded. V+ noise -38 dBu (100kHz) -30 dBu (4MHz) 5V unloaded. V- noise -36 dBu (100kHz) -30 dBu (4MHz) 5V unloaded. The GP25A's noise wasn't measured. Please refer to the FFTs. The GP25A DC voltages also vary significantly with 5V loading. +15.3, -14.42 with 5V unloaded. +16.04, -15.14 with 5V loaded in 500 mA. FFT Measurements of the MS-II noise floor powered by Meanwell supplies. The following FFT is the Meanwell PD-2515 powering the MS. The noise floor for the P25A14E-R1B, RT-50C and a linear bench supply are virtually identical. The performance of these supplies when connected to an actual device are excellent. 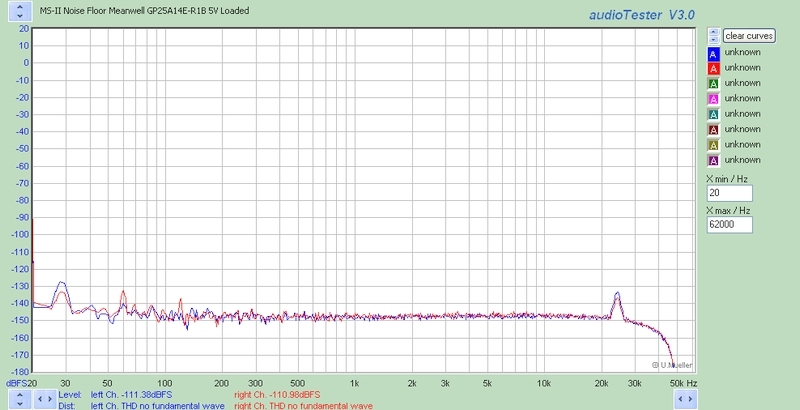 The following is an FFT of the MS-II powered by the GP25A14E-R1B showing why it is unacceptable for audio use. The first frame is with the 5V unloaded, the second is with the 5V loaded in 500 mA. It appears as if the GP25A goes into an EMI-reducing spread spectrum mode at low power levels. The switching frequency of the RT-50C is specified at 100 kHz - it appears that the GP-25A may operate at a much lower frequency. While it doesn't look pretty is that extra HF noise actually a problem in audio circuits with reasonable PS filtering? It might be OK but I'm reluctant to recommend the GP25A because it has it. The GP25A does some other weird things lightly-loaded. There's LF ripple it has on the +15 that you don't see in the DUT because it does have PSSR rejection and local filtering. On the 'scope it looks like crap. I didn't show 'scope outputs on the others because they're fairly boring. I figured the FFT of a device connected to the GP25A was bad enough. I've also found a very nice TDK/Lambda which uses two transformers for tri-output 5V and bipolar 15V. Not only does it offer galvanically-isolated floating bipolar outputs, the use of two transformers eliminates the stacked secondaries that lower-cost supplies have for +5 and +15. The TDK has no minimum load requirements either. The following oscillograms show why I recommend the discontinued Meanwell P25A over the replacement GP25A. Both supplies had thier 5V outputs loaded in the minimum 500 mA. The 30V load was light IIRC about 50 mA. The top image is the GP25A. The upper trace the +15V output the bottom is the -15V rail. The discontinued P25A has far lower ripple and noise. The DSO is sampling at 25 kS/s to show the LF ripple. The GP25A's HF ripple is just as ugly. The previous FFTs were the output of a board powered by both the P25A and GP25A. The PSSR ratio of the onboard devices is pretty good at LF but out-of-band HF response does show degradation with the GP25A. How do these puppies respond to added capacitance, film and electrolytic. It depends. The GP25A doesn't get any quieter with added C on the +15V rail. It might be fine with a linear post-regulator or ripple eater but then it wouldn't be a 15V supply. If it can't plug and play and requires too much I'm not too interested. I also tried an LC and it was poor too. I also have the Meanwell RS-25-48 (48V 0.57A) and the Meanwell RS-25-24 (24V 1.1A) to test. The 24V is being tested for a relay supply. The ripple shouldn't be as big a problem but I want to see if it behaves well. Been using the TDK CUT35-5FF switcher and built it on to a test bed. I like that supply. I've used a bunch of the Meanwell RS-25-48 for phantom, with an RC filter after it. Not been a problem that I've detected. They are adjustable over a small range, so you can land voltage at a best spot for the range of load expected. I am almost tempted to suggest that we roll our own switcher if it wasn't for the UL/CSA approval that has value and is not trivial to secure. An alternative to hanging an off the shelf LDO, even a good one on the tail end of a mean(s)well is to roll our own glorified ripple filter. Are we not analog men? We have the luxury that real LDO designers do not, we do not care about dissipation, current limiting (? ), etc... A modern power mosfet and even medium performance op amp could easily deliver decent output noise. I rolled my own VR for use in my last phono preamp (to end all phono preamps). http://www.johnhroberts.com/P100_PS.jpg I am not suggesting we consider re-regulating the mean(s)well output, but perhaps a slick ripple canceler, designed with our specific knowledge of the nature of the noise. Just spitballing this from a blank sheet, how about a cap coupled current sink/source to oppose noise? If we were only interested in cancelling HF noise a series inductor could be helpful, 60/120Hz noise may reduce the utility of an inductor. An alternate approach could be a mosfet pass element, but that would involve losing enough mV of output to absorb (regulate) the noise. If the mean(s)well output is tweakable we could accommodate mV of regulation loss. PS: On the subject of vinyl I heard a recent stat that vinyl and CD sales eclipsed music downloads. I suspect pricing trends have something to do with this too.